Sharp’s award-winning line of A3 MFDs has given rise to the MX-C381/C311 and MX-C380/C310—full-colour A4 MFDs quite unlike conventional A4 models. While still boasting the impressive speed, superb image quality, multi-layered security, and unsurpassed ease of use found in Sharp’s A3 MFDs, these new-concept solutions take A4 MFD performance to a higher plane of excellence. 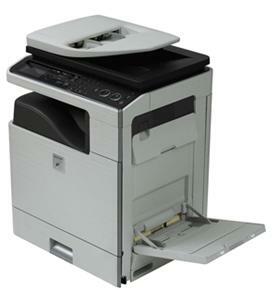 The MX-C381/C311/C380/C310 delivers four-in-one multifunction—copy, network print, network scan, and optional fax—in an eye-pleasing design and space-saving dimensions. The MX-C381/C311, built for IT-centric use, boasts an 8.5-inch touch-screen LCD, while the MX-C380/C310 features a 4.3-inch display. Sharp’s MFD series offers super-speedy scanning and the control and convenience of Sharp OSA (Open Systems Architecture) customisation.